Today is a very special day. Today is Adam's birthday. Now, Adam doesn't care much about celebrating his birthday. Each year, he'll spend time and energy showering me on my own birthday in October with attention and presents, but would naturally allow his own April birthday to pass without anyone making a fuss at all. I see things quite differently. You see, Adam is the most amazing partner. He is loyal. He is funny. He is kind. He is compassionate. He is smart. He is challenging. He is adorkable. He is passionate. He is stubborn. He is my equal and my better half at the same time. Even if Adam isn't one for celebrating, I am, because 27 years ago, a baby was born that would change my life. That baby would grow up to be a man that makes my life better each and every day. It would grow up to be a man that I cannot picture moving forward without. It would grow up to be the man that would be the world's best husband and father. Yes, I already know that Adam is going to be the most amazing dad. You see, I have a lot of doubts about this little life growing inside of me. I wonder if I'll be able to safely bring it into this world. I wonder if I'll be able to nourish it. I wonder if I'll be able to comfort it when it cries and help it grow into an intelligent and compassion human being. I wonder if I'll be the type of mom I want to be, but never, ever -- EVER -- have I doubted Adam's ability to knock Fatherhood out of the park. In fact, I rarely doubt Adam at all. In our time together, he has proven time and time again that his love for me is unwavering, that his beliefs and convictions are strong, and that nothing means more to him than the family we build together. So yes -- today is a day for celebrating this amazing man. I love him. I adore him. I admire him. He is, and will always be, the most perfect partner for me. Happy Birthday Adam! I love you. Happy birthday, Adam! Hope you have an amazing day. Kate, this is beautifully written. Love it! Your love and respect for each other is inspiring—just wanted you to know that. 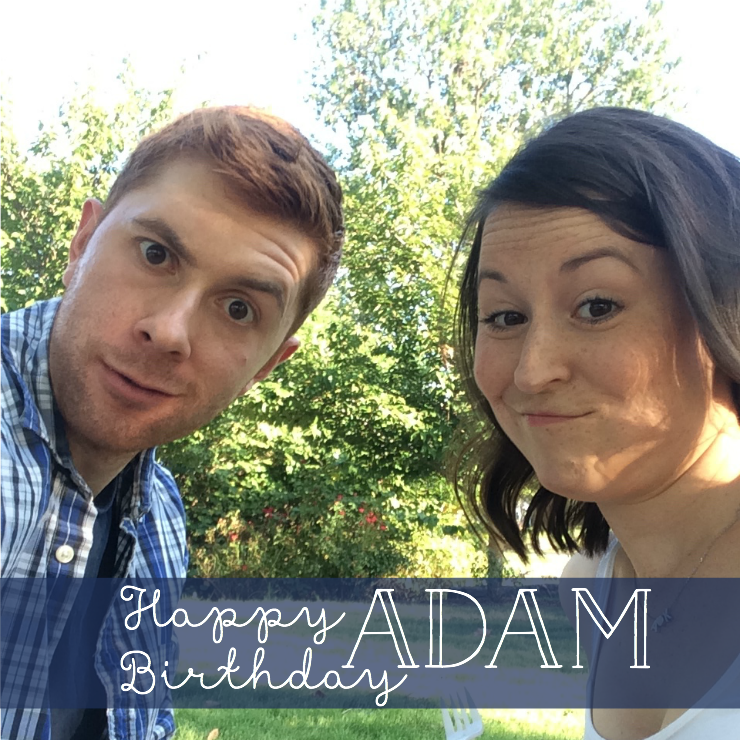 Happy birthday, Adam! Happy Birthday, Adam! Hope you have a great day! Happy birthday, Adam!! Hope it was wonderful. and i'm late to say happy birthday. but i hope it's still happy birthday-ville around there because birthdays deserev to be celebrated for a week!